Secretary-General António Guterres is shocked to learn that the President of Guatemala, Jimmy Morales, has issued a statement declaring 'persona non grata' the head of a United Nations-backed independent anti-corruption commission, according to the UN Spokesman. “He fully expects that [Iván] Velásquez will be treated by the Guatemalan authorities with the respect due to his functions as an international civil servant,” said a statement issued today by the Secretary-General's Spokesman, Stéphane Dujarric. The statement went on to say that under Commissioner Velásquez's leadership, the International Commission Against Impunity in Guatemala (CICIG) has made a decisive contribution to strengthening justice sector institutions in Guatemala, helping to ensure justice was done in numerous cases. “Mr. Velásquez has worked tirelessly to promote a culture that upholds the rule of law and rejects corruption,” it said, adding that the Secretary-General has repeatedly reiterated his full confidence in Commissioner Velásquez. Just two days ago meeting with President Morales at UN Headquarters in New York, Mr. Guterres reiterated the United Nations' commitment to the fight against impunity and corruption, and the Organization's continuing support to the mandate of the CICIG. 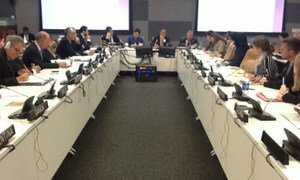 At that time, the Secretary-General also reiterated his confidence in Commissioner Velásquez. The Commission was created in 2006 when the UN and Guatemala signed an agreement setting up an independent international body to support the Public Prosecutor's Office (MP), the National Civil Police (PNC) and other State institutions in the investigation of crimes committed by members of illegal security forces and clandestine security structures and, more generally, help to disband such groups. Alongside its investigations and technical advice, the main goal of the CICIG's work is to make recommendations to Guatemala regarding public policies to be adopted strengthening national judicial institutions – including judicial reforms – to allow them to continue to confront illegal groups and organized crime in the future. Secretary-General Ban Ki-moon today appointed Iván Velásquez Gómez of Colombia to head the United Nations-backed commission charged with dismantling illegal armed groups and tackling impunity in Guatemala.